Brown sugar cookies. What a brilliant idea. I saw these over at Joy the Baker and I had to make them. You should, too. Trust me. You won’t be disappointed. I ate a few (okay, a handful) on Wednesday night, and then I took the rest to reading group on Thursday. Good thing, too, or I would have eaten them until my stomach hurt. So good that I even forgot to be impatient about Agnes, for a little while at least. She is still blocking on the dining room table. Maybe tomorrow the sweater will be dry enough to wear? 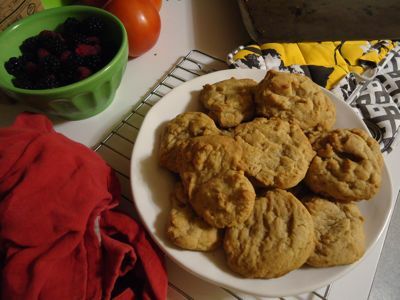 This entry was posted in kitchen and tagged baking, brown sugar cookies, cookies, joy the baker, kitchen by barefootrooster. Bookmark the permalink. I saw those, too, and nearly went to the kitchen and made them instantaneously. Good to know that they taste as good as they look! Needing something special for a bake sale next week. Will give these a try. Ohh these cookies sound perfect, I will indeed be giving these a go. Can’t wait to see Agnes all blocked and pretty. Your knits are always amazing! Made these cookies two days ago with added chocolate chips! They are delicious and remind me in a way of mild gingerbread cookies.